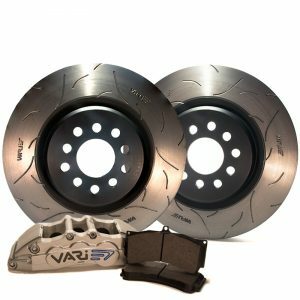 Vari GTS (Street) kits are full Calliper and rotor upgrade kits for street and track day use on light vehicles ,and old school Muscle . The Billet CNC calipers are precision designed and engineered to have a matched clamp load to suite OEM Master cylinder and vehicle weight. Vari ST brake pads has excellent stopping power over a wide range of temperatures making them great for high performance street use. Great track performance for use with Muscle Cars , Hot Rods and light cars. 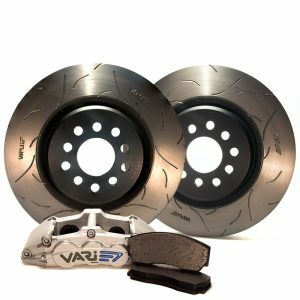 Vari GTP (Performance) Kits are a high performance full Caliper and rotor upgrade kits for street and track day use on Heavy / Late Model vehicles.The kit is built around our 618 calipers family to suit the 17″ to 19″ wheel sizes. These 618 calipers are CNC from aviation grade alloy and engineered to be highly rigid while keeping to a slim line form factor aimed to support a narrow offset style Wheel design. Vari ST brake pads has excellent stopping power over a wide range of temperatures making them great for high performance street use. Great track performance for use with Heavy Late Model Cars, Muscle Machines and more. 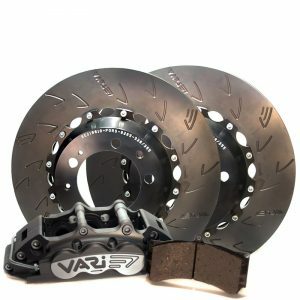 Vari Full Race Brake Kits are the ideal candidates for HEAVY to MEDIUM weight vehicles with track type levels of HP all the way up to 1000 HP which are outright Track attack type vehicles with ether conservative 17″ inch wheel packages, for use with affordable track tires or 20″ plus high performance street tires that are expected to perform large amounts of stops from well over 180 km/h ,practically endless amounts of stops from down right illegal highway speeds and especially give excellent peddle feel after 20 plus laps of your favorite all out race track on any given track or race day which u plan to not only attend but downright blast your way through.Now available for 14″-16″ applications too.